Date of publication: February 01 2015 . What do you like to do: to give or receive gifts? I'll bet that the first would be the majority. And this is not an allegation. It is supported by psychologists, who as a result of multiple studies have established an interesting fact: the person giving the gift, feels happier than receiving the aforesaid. They have even been given a kind of definition of this feeling of inner happiness - "heart light." And who would not want to see the faces of loved ones, a radiant smile lit up thanks for your attention to his own person. So, you guessed it, that in today's remake will discuss the present. Sometimes it is very difficult with his choice, except for those situations where there is an exact confidence in its relevance and usefulness. Where did draw Gift ideas? As always, we will help IKEA. Let's see how simple lantern Borba from ikeevskogo Directory when fantasy turns into shred gift with character for a special occasion - wedding anniversary. 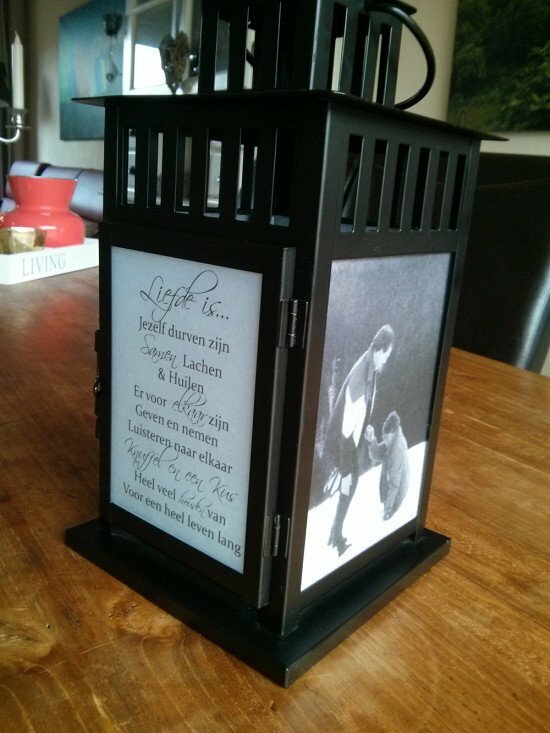 To do this, just need a proper self lantern in black or white version, glue, paper, scissors, brush. We get out of the lamp glass plates, pre gently straightening clips. Three of them with glue attach beautiful photos that will be as vivid recollection of the coming event. The rest of the plate very well serve as a place for spiritual wishes and kind words. The plates already together with registration returns to his seat. Voila! We can only present Borba perpetrators of that very special occasion.